What does the wrong picture look like? For the best movie experience it is vital that the video material is reproduced as the director intended. But most TVs today are not calibrated according to the picture standards that movie studios use. Instead, TV manufacturers battle for the shoppers’ attention by presenting the most oversaturated colors, boosted contrast levels etc. People love to be impressed and oversaturated colors, maximum brightness and artificial sharpness sell - at least at first glance. The tough reality hits later when the buyer has set up the brand new TV in the living room, only to find that movies look weird and horrible, human skin tones look wrong, and motion looks artificial. All combined; the effects severely degrades picture quality. In this article we will give you insight into which specific phenomena contribute to wrong picture quality – and how it actually looks. We use one correct picture throughout the article and add a range of “tricks” on it so you can assess the effect. We have also included the original picture for reference to the left in all picture examples. Some effects have been over exaggerated for effect. 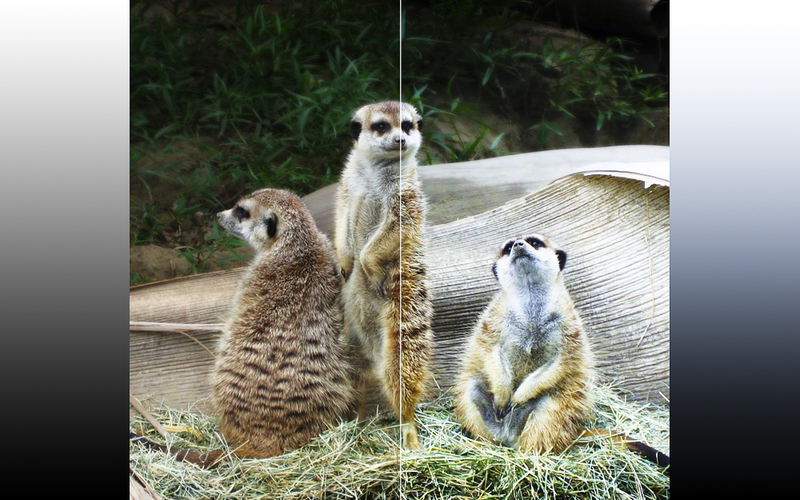 This is the correct and original picture rendering showing three meerkats (click to enlarge), just as the photographers wanted to present them. Please remember that this is not necessarily equal to how it looks in nature, but as long as the photographer, director, or producer determines how the pictures should look, the display panel’s sole task is to reproduce that – and nothing else. We have added a smooth gradient on both sides of the pictures to illustrate how the grey scale is affected (here it is perfectly smooth). In this example we have increased contrast in the picture, and this is commonly seen with LCD-TVs. It is a typical ploy to trick the eye into believing that the whites are “whiter” and the blacks are “darker”. But in reality it only crushes details (especially in the dark areas behind the meerkats), blurs reality and destroys the “picture feeling”. Notice how the dark and bright areas of the picture lack detail (also seen in the gray scale), because the gray tones fade to quickly into the absolute black and white points. Another trick that is used on pretty much any TV in a shop is oversaturated/boosted colors. We have boosted overall colors by adding extra red, green and blue, to the picture on the right side. With the oversaturated colors we create an illusion of “vividness” and “intensity”. 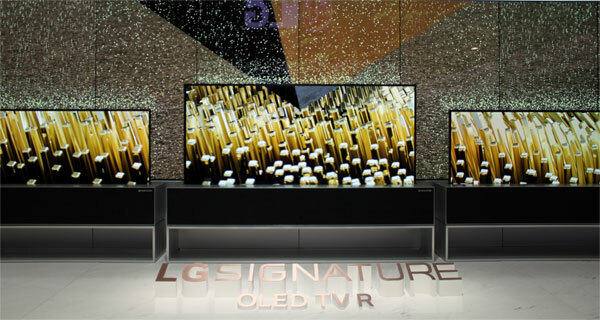 For the right type of picture material – the kind chosen to highlight TVs in stores – this can look impressive at first. But you will soon learn that it completely annuls the look and expression that the movie producer has tried to recreate in the specific scene/movie. And it even has a degrading effect on color gradation, meaning that some color shades melt into each other, thus reducing color details. Let the producer or photographer decide – not the TV manufacturer! Strong colors are often visible on lips, which appear to reddish or on skin color, which can look tanned or reddish. Regardless of which colors are manipulated it will always have a degrading effect on picture quality. Color temperature is measured in Kelvin and defines the “temperature” of a picture. When a color temperature is too high on a display panel, pictures become too bluish and cold, and when a color temperature is too low, pictures become to reddish and warm. Color temperature is altered on 95 % of today’s TVs, because TV manufacturers know that a cold temperature is preferred at first glance, so they simply trick you. 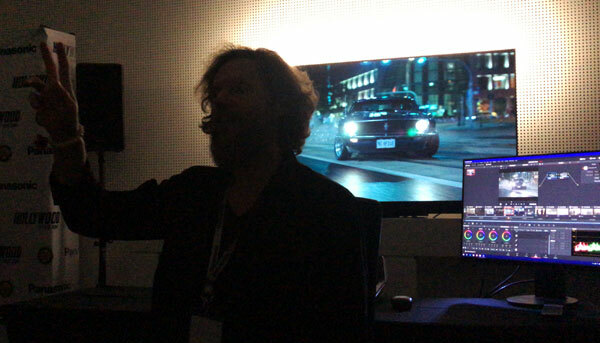 The correct and standardized color temperature for display panels is 6500 Kelvin – nothing else.Sure, movie studios can change the color temperature in their movie, but imagine that you are watching a movie scene with a snow-covered landscape and the both the studio and TV wants to use a cold color temperature; now you have a double effect, which looks and feels wrong. In the next example we have used a too low color temperature in the picture to the right. Too low color temperatures below 6500 Kelvin results in warm and sepia-tone pictures. Imagine that the movie producer wants a scene to look extra warm and cozy, thus lowering the color temperature during editing, and the TV manufacturer has calibrated the TV with a much too low color temperature, you will see a double effect, and extremely reddish – and wrong – pictures. Luminance of grayscale (the raw grayscale is shown next to the pictures for reference) is extremely important for correct picture reproduction, because luminance contains most of the picture information in a video signal. 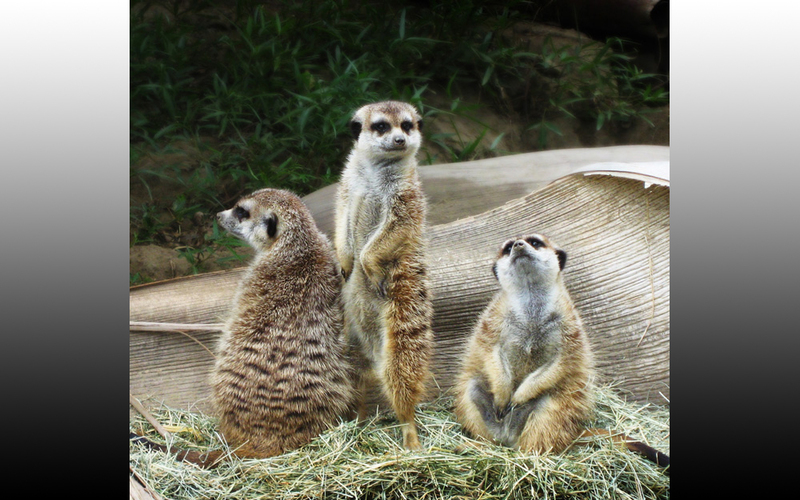 In this example the gamma setting is too high, resulting in too dark mid tones and extreme loss of detail in the dark areas of the picture (see the woods behind the meerkats). Notice how the black and white end points are unaffected in the grayscale but how mid tones are pushed towards black. 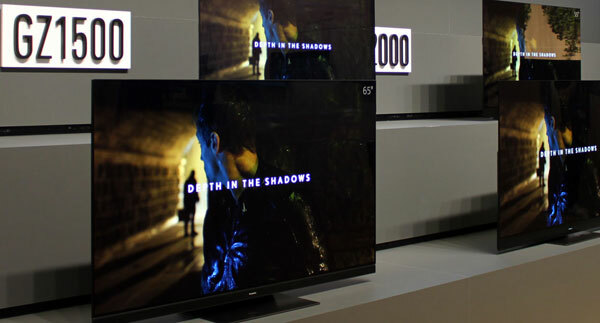 Gamma is wrong on 95 % of today’s TVs, due to TV manufacturers’ quest to “enhance” contrast. The standardized gamma curve for TVs is 2.2 for all grayscale luminance points. In this example gamma is too low in the mid tones, meaning that luminance in the mid tones is too high. The picture looks washed out and lacks depth. Details are also being crushed. A too high brightness setting on a TV can affect gamma in this way. Typically TV manufacturers use a mix of too high and too low gamma in different sections of the grayscale in our to “enhance” both dark and bright details, but the truth is that they are only making things worse, which leads us on to the next subject. A non-linear grayscale tracking is a very common problem on digital displays. This can lead to a number of problems, including false contouring, color tints and more. In our example the bright shades have a reddish tint, the mid tones have a greenish tint and the dark shades have a bluish tint. These effects are clearly shown in the grey scale next to the image but harder to identify in the actual photography – but you still notice that something is wrong, right?. What is sharpness? Sharpness equals detailing to most people, but the sharpness setting option in a TV menu has nothing to do with that. Almost every TV sold today come with added artificial sharpening effects – either static (always there) or dynamic (added occasionally). For soft analogue signals artificial sharpness is acceptable and widely used but for digital signals it is a no-go.The sharpness setting in TVs enhances contrast at the edges of objects – for example around heads, profiles, world objects etc. But it is important to understand that this information is added by a filter and has nothing to do with the source video material – it was never captured during recording or added by the creator of the source material. At first a sharpness filter might seem to make pictures look sharper, but you will soon realize that it also adds grainy noise and affects detailing (negatively). In the example below you can clearly see how the meerkat’s furs have been enhanced and how it looks unnatural and wrong. You can also see how it adds a “shadow” on the grayscale (on the left side of the right grayscale). Posterization is connected to the internal picture system. Imagine that you have eight shades of red – almost similar but still different. If the internal color system processes the eight different shades but only recognizes them as two different shades, posterization can occur. In the picture example you can see how color transitions – that should have looked smooth – appear to be rendered in “steps”. The effect is particularly noticeable in the cortex and on the ground behind the animals - and of course in the grayscale gradient. This is not a “trick” but just a consequence of bad picture chips that TV manufacturers use to save production costs. Analog television signals and some digital signals are transmitted in the so-called interlaced format, where the pictures are cut into two frames; the first frame containing odd (1, 3, 5 etc.) image lines and the second frame containing even (2, 4, 6 etc) image lines. The process of putting even and odd lines back together is not tricky but some TV manufacturers try to save costs by implementing a cheap solution. If the “de-interlacing” process is processed incorrectly, jagged edges can occur. Notice how detailing suffers in the right side of the picture below. As mentioned in the introduction we have exaggerated the effects in some picture examples but by now you should have an idea of how different image phenomena affect picture quality. In the last picture we have added several of the above-mentioned phenomena in a less evident way to demonstrate a picture that is “wrong” but not way off. When combined it is really hard to tell exactly what is wrong. Try yourself before jumping to the last paragraph. We have added the following effects: A slightly too high color temperature, an S-shaped gamma curve, artificial sharpening and oversaturated colors. This example is far from unrealistic and representative of the “out-of-box” settings on most TVs sold today. 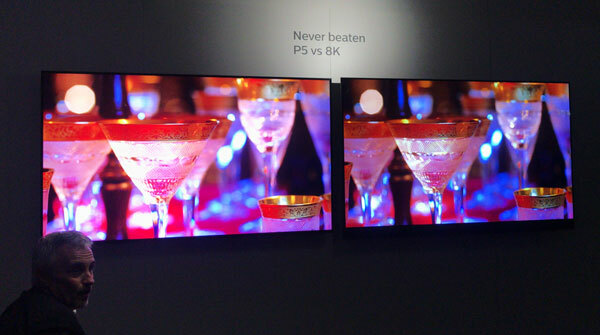 When examining TVs here at FlatpanelsHD we try to look for these errors – amongst other things. During calibration we try to figure out what is wrong in order to correct it. This requires more than measurement equipment because you need to have an idea of how the basic image principles work. It is usually not that complicated to calibrate a TV but it requires equipment and experience. We use measuring equipment for testing but to aid you in your quest for the best possible picture quality, discs such as Digital Video Essentials can get you started. FlatpanelsHD also include calibration settings in all our reviews. Good luck!